Have you ever wanted to finally get rid of all the persistent weeds in your garden and replace it with a sleek, clean looking option? Then using landscape fabric is the best solution for you. It's easy to use and would give your garden a pristine look. Landscaping fabric can be made of different kinds of materials which make it hard, if not impossible, for weeds to grow in your garden and act as best weed barrier. In looking for the best landscape fabric for your garden, you should go with the best kind which would fit in your budget. In this article, you will learn all about landscape fabrics, the benefits, and kinds of landscape fabrics as well as some of the best products available in the market now. The Final Verdict – Which are the Best Landscape Fabrics? There are different benefits for using landscape fabrics in your garden, aside from giving it a clean and beautiful look. These benefits may convince you to start laying out the best kind of landscape fabric in your garden. These benefits would apply to different kinds of gardens so no matter what kind of garden you have; you can be sure that these benefits would apply to you. Weeds are very damaging to a garden and they are very persistent! They are the reason why your plants are not flourishing as much as you may want them to and that is because the weeds actually steal the valuable nutrients meant for your plants. Landscape fabrics give your plants - the ones which are more difficult to grow or especially the weaker plants, a fighting chance to survive as they prevent weeds from growing and spreading all over your garden. You can use best weed barrier in order to protect the plants with the weeds. Once your plants have grown enough, they may provide enough shade to stunt the growth of weeds by minimizing the amount of sunlight which passes through. Though landscape fabrics are both porous and permeable, a lot of them are very effective in controlling the crumbling of your ground and the erosion of your soil. This would be very beneficial especially for gardens with hills and slopes. Gardens with this kind of terrain are prone to erosion, especially during the rainy season. The roots of your plants which extend under the landscape fabric and into the soil are secured from rainwater which flows and soil washout which has the tendency to leave the roots exposed to infection and damage. Landscape fabrics also prevent mulch, rocks and stoned from sinking into the ground. This would save you a lot of money as you may be spending a lot just to have mulch in your garden, only to find out that your mulch has already been enveloped by the soil after a short time. A lot of landscape fabrics can be cut and placed in your gardens easily. They are also sturdy and may be resistant to tears, cuts, and punctures. A lot of them are also resistant to decay or molding. Most fabrics are long lasting and can last for years as long as you install them correctly. Landscape fabrics are made from different materials (which will be discussed further) and come in a wide variety of colors and sizes. This would allow you to pick the one which would fit into your garden the best. These benefits are all in favor of you and your garden so you can start thinking of what kind of landscape fabric would be best for you. Read on to learn about the different types of landscape fabrics based on the materials they are made of. In buying landscape fabric for your garden, you'd have to look for a few key features and take note of some factors. Finding these features would ensure that the product you choose would be the best one for your garden. There are lots of choices out there and these guidelines could be the deciding factor on which ones you will choose. The first thing to consider is that your fabric would allow air and water to go through to your soil and to your plants. It has to be breathable enough to keep your garden healthy. This would mean that you may have to avoid those which are made from plastic materials as they are not only harmful to the environment but they aren't breathable too. You would most likely select a landscape fabric which would add to the beauty of your garden. The last thing you want is to end up with a fabric which would make your garden look tacky or artificial. To save money, you could choose a landscape fabric which you can install yourself so you won't have to call for a professional to place it into your garden. There are many simple fabrics out there which are easy to install with the use of simple tools and a little bit of effort. 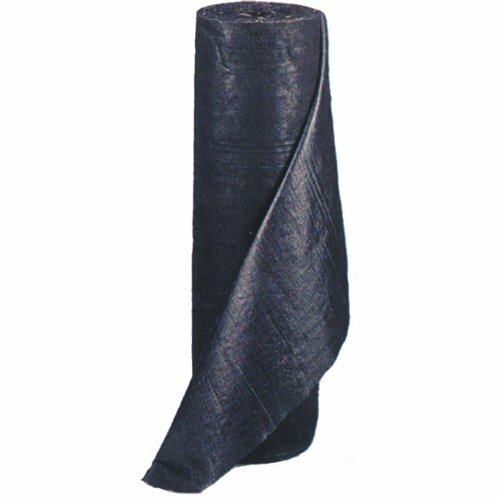 For sure, you'd want a landscape fabric which would last for years without wearing, tearing or looking old and damaged. Look for choices which boast the durability and long lasting feature so you will be able to get the most out of the money you spend. Yes, your landscape fabric must be able to get rid of weeds effectively, but not the other living things in your garden. There are plenty of organisms in your garden which are very beneficial to your plants. Take this into consideration when choosing a landscape fabric for your garden. It must not contain chemicals which would harm beneficial insects as well as the soil which you will place it on. Knowing these factors will surely help you make an informed and wise choice of landscape fabric. Now let's take a look at the best products in the market which you may choose from. Now that you know all about landscape fabrics, you may want to purchase one for your own garden. But which one? Here we have a comprehensive look at the top 5 products which are available on the market now. Read on and see which one would suit you the most. This product is best if you'd like to prevent the ground in your garden from crumbling or eroding. It not only prevents erosion but it also prevents weeds from growing as well. 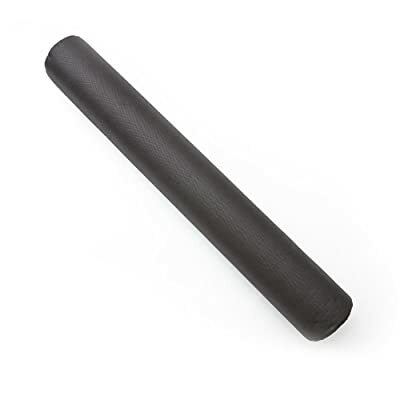 It's both lightweight and durable as it is made from the fiber of the highest quality. It is versatile and easy to cut which is why a lot of people have chosen to install this product in their gardens. Prevents soil erosion, crumbling of the ground and weed growth. Sturdy but lightweight, making it easy to cut up to fit your garden. More affordable than other products in the market. Controls weeds and lessens the chance for erosion of soil. Material is quite thin and isn't sturdy against rodents. Has the tendency to tear when placed in uneven terrain. The DeWitt Pro 5 Landscape Fabric is one of the most popular products available on the market as it provides durability and strength because of the woven fabric material which is needle-punched. The makers have designed this product so that it is 100% opaque, which prevents germination and photosynthesis of weeds. This nifty feature would mean that you don't have to use pesticides and other chemicals to get rid of weeds, which are harmful to the environment. It also comes with a warranty for its UV deterioration and is made of 2 layers of polypropylene material. Has a nifty opaque feature which stops weeds from growing. It can cover large areas in your garden. Protects your plants from UV rays and is extremely permeable. It's a heavier than other kinds of landscape fabrics. It doesn't block all kinds of weeds, only the small, weak ones. 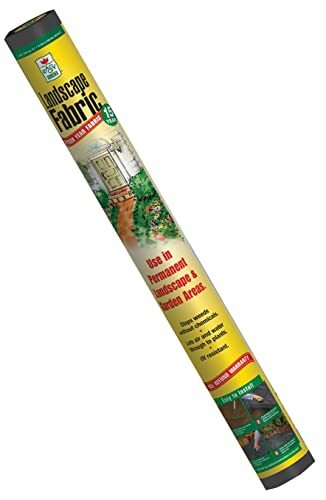 Made by the top brand for gardening tools and products, this landscape fabric guarantees that you would enjoy up to a year of a weed free garden. You will be able to use this environment-friendly product for years to come as it is thicker and heavier than other products out there. Though heavier than others, it is still breathable so that air and water can pass through it, straight to your plants or your soil. It also prevents too much light from passing through it so weeds won't grow rapidly. The product will last for about 12 years and would give you 12 months of a weed free garden. Prevents dangerous chemicals from leeching into the soil. Permeable as it is made from fabric which is non-woven and has been treated with hydrophilic. Durable and will last for years in your garden. Made of a thicker and heavier material but is easy to cut. Reduces the growth of weeds because only very minimal light can pass through it. The material doesn't allow for people to walk on it. There is a question on the longevity of the product. One of the more popular choices available in the market, this product also happens to be one of the most budget-friendly options. It is durable because of the material it is made of and is meant to last for more than 10 years. It's made of a thicker material which would ensure that it won't cut or tear even if placed on a rocky terrain. It prevents weeds from growing in your garden and it's quite simple to install. Made up of a thicker material while still remaining permeable. Doesn't tear easily since because of the material it's made of. Easy to cut and easy to install. Durable enough to last for about 10-15 years. Allows air and water to seep through to keep your soil and plants healthy. 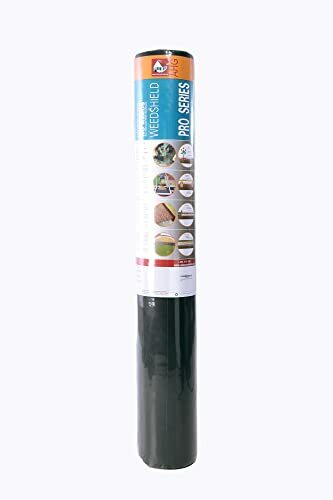 The PRO Series Weed Control Landscape Fabric is sturdy and would last for a long time as long as it is placed in the garden correctly. It is permeable enough that it allows water and air to pass through - straight to your plants but not to the weeds. It is made up of 3 layers of bond fabric which are spun, giving it extra strength and durability. It also minimizes the light which passes through the soil and prevents erosion of the soil in your garden. Effectively prevents the growth of weeds which can do harm to your plants. Prevents soil erosion and can withstand different weather conditions. User-friendly and very simple to install. Allows water to permeate, so it allows nutrients to be supplied to plants and not to weeds. There are a lot of choices out there and a lot of them come with their own pros and cons. All you have to do now is weigh your choices and see which one would suit your needs best. You now know all about the landscape fabrics as well as the best products out there. If you prefer a product which would not only prevent weeds from growing but would also prevent the erosion of soil, you can go with SCOTTS Pro Fabric. It's sturdy, lightweight and very easy to install. However, if you want a product which can withstand different weather conditions you can pick the PRO Series Weed Control Landscape Fabric. This is very durable product which is easy to install and considered as one of the best weed barrier. Go ahead and start making your garden look sleek and clean by finding the perfect landscape fabric which would be perfect for your garden.